As course creators, our number one priority is empowering our learners to succeed. 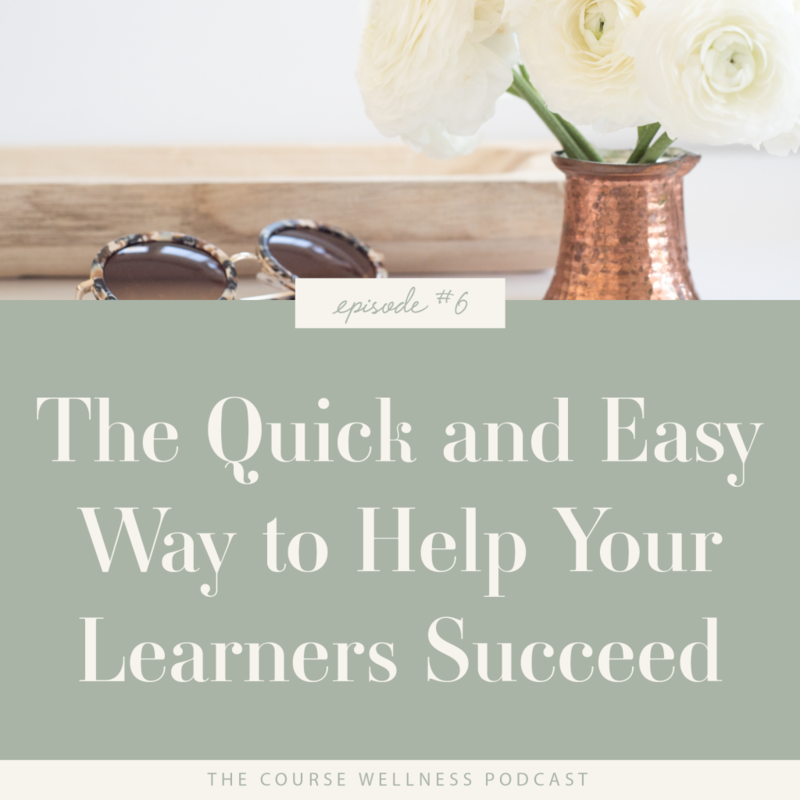 In today’s episode I share why activities are essential to learner success and how you can make sure the activities in your course are as effective as possible. Activities are arguably one of the most important topics when we’re talking about teaching and learning. And that is because learning is not the product of teaching. Learning is the product of the activity of learners. That’s a John Holt quote and I absolutely love it because it is absolutely 100 percent true. First of all, activities really are motivating because you have the opportunity to give the learner a quick win right off the top. 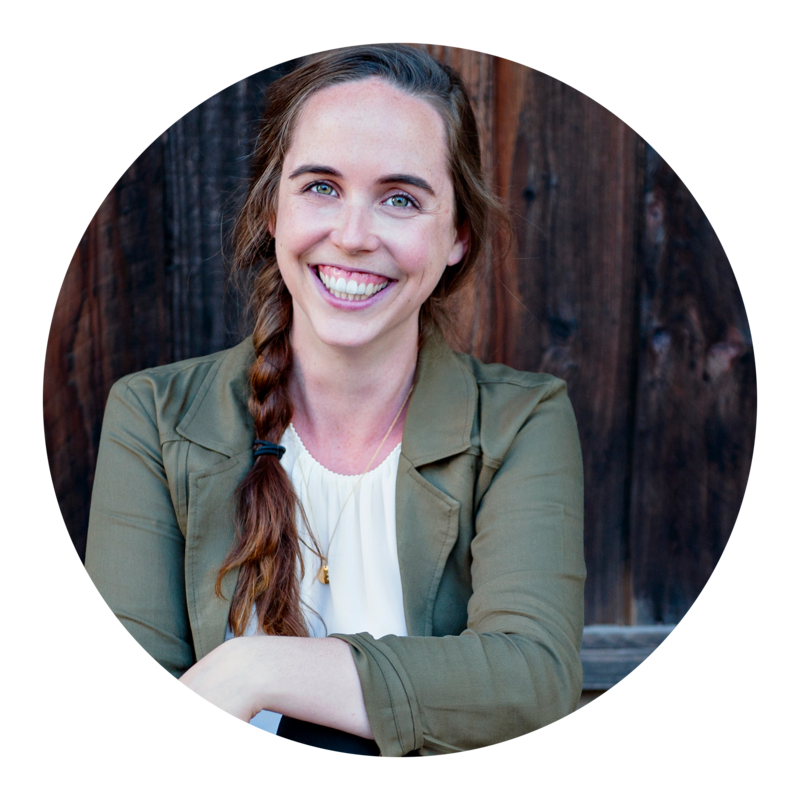 I think it’s a really common thing that happens, especially for creative entrepreneurs. It’s really easy to get stuck in that analysis paralysis. I don’t know if anyone else is like this: I can make a checklist. I can make a spreadsheet like nobody’s business but when it comes down to actually implementing it can be really scary and really hard. So if you have an amazing teacher, an amazing coach that is inspiring and encouraging you to take little tiny action steps right away, it is so powerful. It’s that motivation. It’s like, wow, I’ve only been in this course for the intro and I already have one thing accomplished. It really hones in on that motivation because as we take those little steps, we’re making progress. A little step is still a step in the right direction. 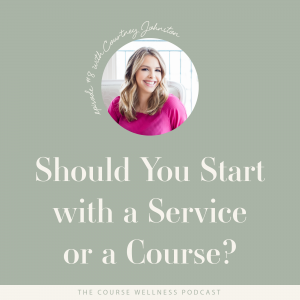 The other reason why activities are so, so, so important is because they help you because it answers the question that was brought up two episodes ago: How will you know if they’re actually learning? How will you know if they are succeeding? if you have learning outcomes set and you are asking yourself: ‘how will I know they’ve actually accomplished it?’ You need to see them actually doing something. They need to have space to start implementing what they’ve learned. So when you see them starting to implement and starting to share, you’ll know that they’re actually learning. 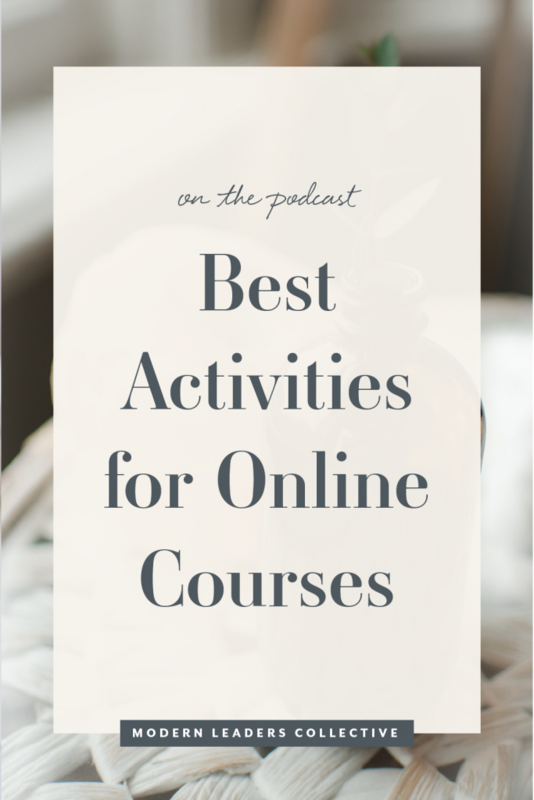 How do you include the right activities? As amazing as activities are, we don’t want to throw in activities just for activity’s sake – I like to call this the ‘worksheet trap’. This is where we add in a worksheet that doesn’t actually serve a purpose beyond being able to say that there is a worksheet for that lesson. So the way to avoid this trap, is to connect all of your activities back to your learning outcomes. In order to create an activity that is essential for the learning, you want to make sure that it is connected to a learning outcome, and that it has a clear purpose. Now, activities can serve quite a few different purposes in a course . For instance, if you are opening a module, an activity can really set the tone. Example: If you want your learners to be in a really creative, open heart space, then maybe opening a module with a visualization or a gratitude activity can really set that tone. So before you decide to include any activity, ask yourself: is this essential? Is this enhancing the learning? What is the purpose of this activity? Another key component of a good activity is it being interactive. You really do need that feeling of interacting, engaging, wrestling with the learning or the tools that are being presented. And so when I’m talking about interactivity, I don’t necessarily just mean interacting with the other learners in the course, although that is super, super important as well. I’m talking about interacting with the concept, interacting with the tools or the templates or the platforms. When you look at your activities, depending on what you’re teaching, how often are you actually getting them to start interacting with what you’re teaching? Example: if you are creating a course on Trello, how often are you having your learners go into Trello and start doing things? Not necessarily a giant task, it can just be a matter of a small, quick five minute, go create ONE board. So the third thing that I started to touch on is that a good activity is bite sized. One of my biz friends affectionately calls this delicious learning because we want something that is bite sized, easily digestible, and not overwhelming. Because as adults, we are busy and we’re lazy, so if it’s too long we won’t finish it (or maybe won’t even start it!). So the more that you can make your activities bite sized, easily digestible, the better. And a key thing to remember with this is no one is ever going to complain that you made it too easy. Say it one more time, no one is going to complain that you made the learning too easy. This is where the learners actually DO the thing that you are teaching. What can you get them to start doing right away? What is a small quick win so that they can start engaging with the concept in a way that doesn’t feel overwhelming. This is where the learners show that they understand and can do the thing. This comes back to the idea of ‘how will you know that they’ve learned what you want them to?’ A great way to do this is social sharing (this comes into our community piece which we’re going to talk about in next week’s episode), but I love the idea of having a community around a course where learners can really share what they’re working on. Example: If you have a course all about visual branding and one of the activities is developing a mood board, then you can have the learners share pictures of their mood board in the community. Not only do they get to get the feedback and the ideas and the energy of the other learners, but you get to go and see how many people are sharing. That gives you a couple different opportunities: one to see are they doing it in the way that you’re hoping they will? Are they following the instructions? Are they running into snags? Are they making common mistakes? It also gets you a chance to see who’s not engaging and that’s another touchpoint for you to grab those learners that are maybe starting to fall through the cracks and pull them back into the learning experience. The third type of activity is a reflection activity. Reflecting on learning is such an important action by the students. It can be as simple as a little check in like, what did you notice about that activity or how did you feel. It’s a really good way of just saying what are they noticing? What are they noticing about the results? Just giving them that chance to pause and check in. I really encourage all course creators to do this in any learning experience by having a pre and post learning reflection. At the very end of the course, give them a chance to reflect on the entire experience, going back to what they wrote in their pre reflection and also just sharing their thoughts, thinking about their experience, and really having that time to reflect on it. Give them a chance to slow down and reflect and really take that time to look and go, wow, look at how much I’ve accomplished. Look at how far I’ve come from where I was before. 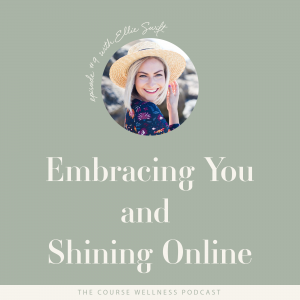 I want you to reflect on this episode and think about what did you learn, what was your key takeaway? Was there something that was surprising to you? Was this kind of what you thought it would be? Did you learn something new? If you only do one thing, implement one thing from this episode, what will it be?